Josh teaches beginning to advanced acoustic and electric guitar. He uses his knowledge of a variety of styles to help students reach their individual goals. His comprehensive approach to teaching ensures that students master important musical concepts and fundamentals. He believes playing and studying music should be enjoyable and brings this attitude to his lessons. Josh is a guitarist from Seattle. For several years, he worked on Carnival cruise ships as a guitarist and music manager. He is currently involved in numerous musical projects and plays at venues and events around Seattle. He is proficient in a number musical styles, including jazz, rock, R&B, and funk. He is a member of the jazz-fusion group Circling Drones, leads a jazz group, and plays solo guitar. 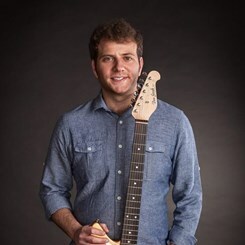 Josh earned Bachelor’s degrees in Jazz Performance and Music History and a Master’s degree in Jazz Performance from the University of Nevada, Las Vegas. While at UNLV he taught private lessons and led the school's jazz guitar ensemble. Other career highlights include playing at the 2011 Latin Grammys, touring with the progressive rock group Autumn Electric, and being a semi-finalist in the Yamaha 6 String Theory Guitar competition in 2012. Request Lessons with Josh Williams today!